I would’ve preferred to make the bigger size, but because the original skirt was in swirled panels, I could only barely fit the mini pieces into the largest panels, and I didn’t want extra seaming on the bags. The only thing I had to purchase here were the zippers, and we’ve each got a new little evening bag! 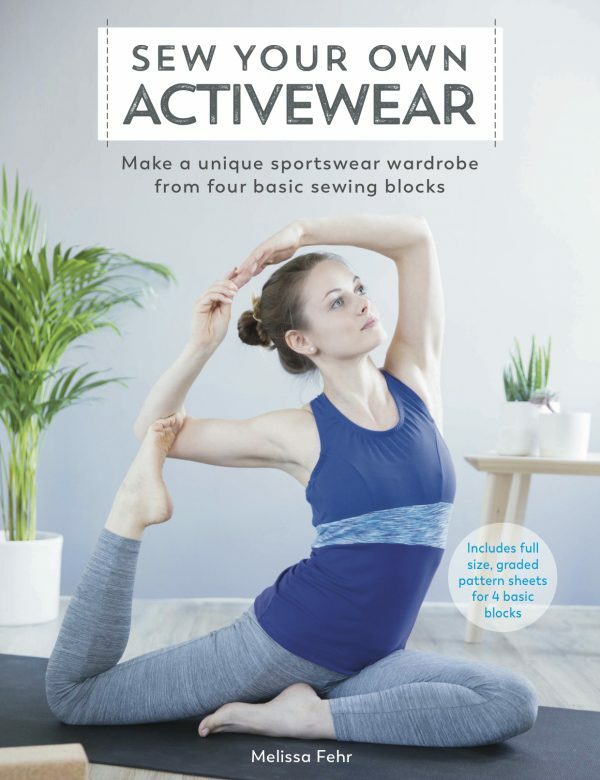 Having finished the wristlets with several hours home alone remaining, I turned to a project I’ve been meaning to do for weeks – replace my very well loved and now falling apart pleated denim look leggings. 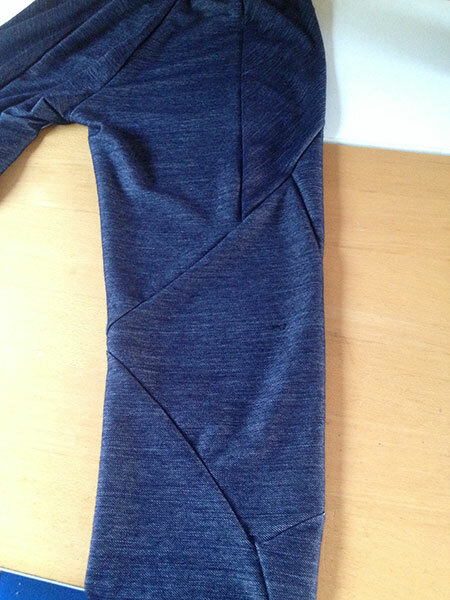 I could’ve just made them again, but I thought I’d bring out the Donna Karan seamed leggings pattern again since I generally liked the fit. These will get a full post, but I eliminated the ankle flaps here and they’re now 90% perfect. And guaranteed to be worn as much as my previous “denim look leggings”! 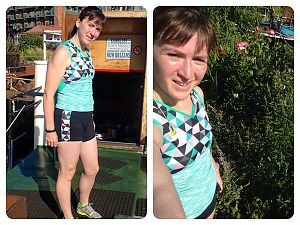 I started off Monday morning with a hot, sweaty, speedy intervals session along the river, and I thought the perfect outfit to make me feel like an elite would be my teal mixed print VNA & Duathlons I showed you on Friday. Since you didn’t get to see me wearing it before, we snapped some photos before and after my run. I’d run in them separately before, but together I feel unstoppable! The gripper elastic really freaking works on those booty short length hems, too. Highly recommended, even for improving RTW hems that slip around. 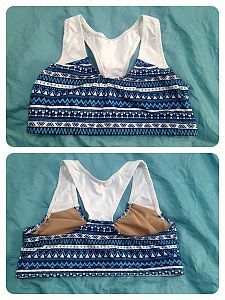 I carried on the momentum by sewing up a new sports bra, doing pretty much the exact same finish as my previous Jalie tribal print one last summer, but lowering the neckline by 4.5cm. 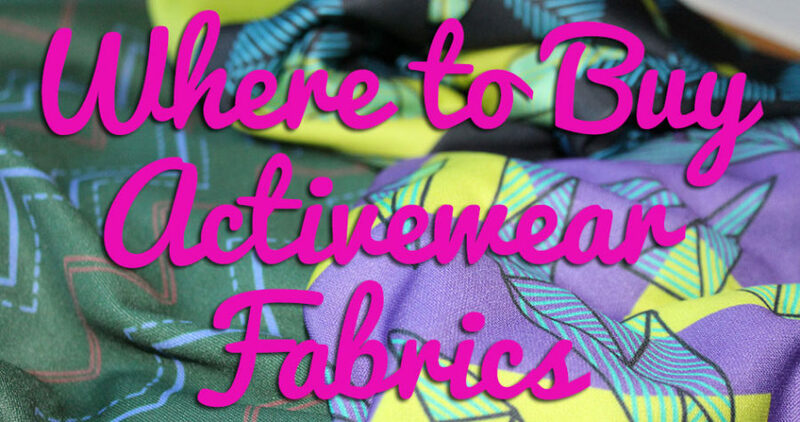 The Aztec print is from Spoonflower (only a fat quarter, because I’m cheap!) and the white supplex is leftover from way back when I made my sailor girl running costume three years ago. What can I say, I have a deep lycra stash to work through! 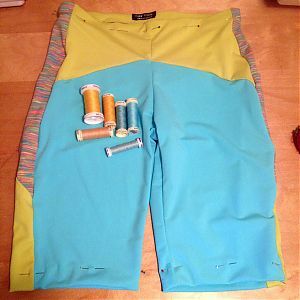 And last but not least, I wanted to do something with this combo of colours in my wicking lycra stash, so I made another pair of Duathlon Shorts (biker length). 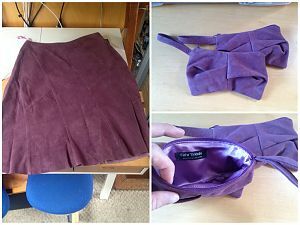 But my piece of citrine supplex from Sewing Chest was only 18cm tall and I loved the colour too much to only have it on the Lower Side, so I drew some curves and colourblocked the front and back with more! 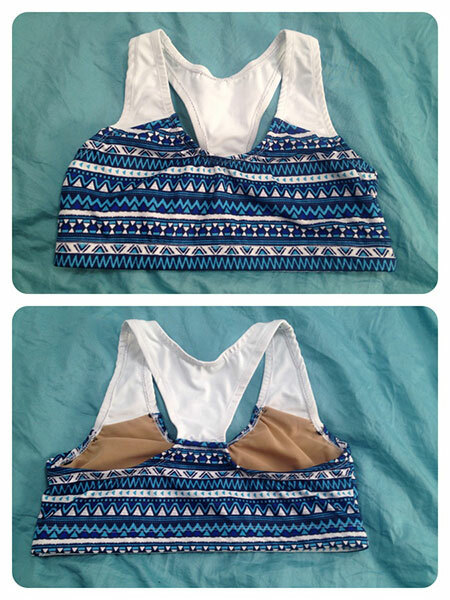 It only needs the coverstitching done, and you’ll see more of this in a photoshoot, too. 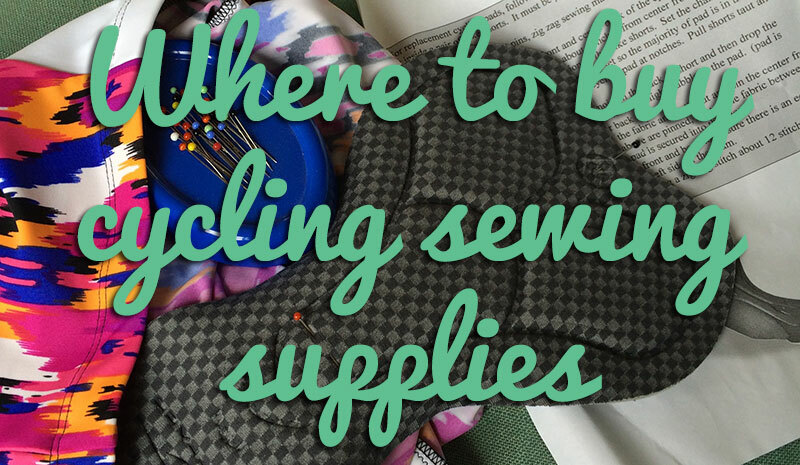 Anyone else try additional seaming on my patterns, out of fabric necessity, or pure whim? * I also squeezed a two hour hilly trail run plus another two hour guided walk into Saturday, and a bunch of caulking of the walls of my future sewing room on Sunday, plus some client work on Monday! 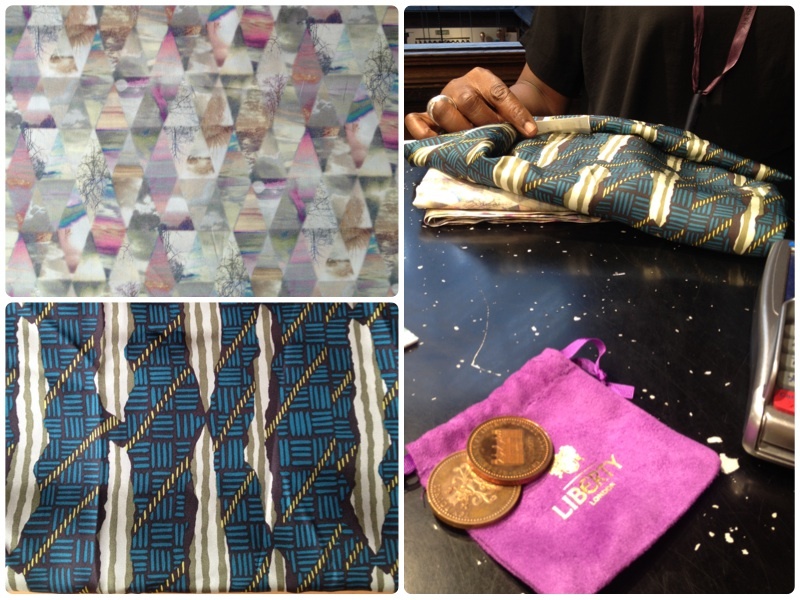 Separator image Posted in In Progress and tagged with exercise, fehr-trade-patterns, jalie, leather, recycled, shopping, silk.